Oh yikes! Well at least you guys know what to do, sorry for all the drama though. Have you tried applying warm compresses to help it reabsorb? Bummer! Since it has been getting less and less though, this may just be the tail end of all the gushing. Hope so! And YAY for !!! How are you handling getting her up and down three flights of stairs? That has to be hard on all of you! Shaking head… dang. I am so sorry and yes this is stressful, I know it is! Just get a nice old soft facecloth or hand towel and run some warm water on it. I start out with hot, wring it out then shake it till it gets to a nice warm temp but not too hot. Gently place the facecloth on the incision and hold it there for a few minutes. That’s really all there is to it. I wring it out pretty well too.. so that it isn’t dripping. You can do this several times a day. Jackie gave perfect insight on how to make a compress! Thanks Jackie, I may feature that in a post. Meanwhile you may also want to check out this cabbage poultice compress we learned about from another member. Since then, others have sworn that it works. I will have to read on that as well… truly interesting some of the things we can learn along the way. I learned a new trick this week for people too.. my youngest grandson got pink eye (he is in kindergarten) and when I told one of the guys I work with, he told me that raw potatoes helps wonders for pink eye. It soothes the eye and dries up all that nasty discharge that they get. Sure enough, I looked it up online and found a whole article on how the potato has natural astringent qualities …. I love this kind of stuff! Hi, I’ve been following along- I’m sorry you are having a rough recovery. 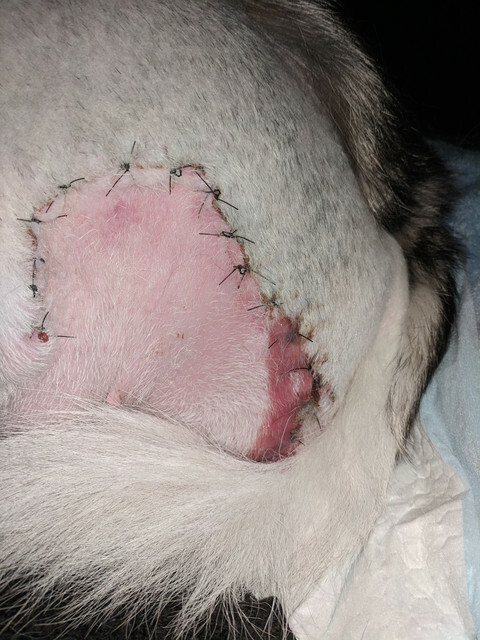 Something occurred to me today when looking at your incision pictures. I don’t think I’ve seen a rear amp incision as high up on the hip as Ziva’s. I looked at all the pictures attached, I don’t think it’s the camera angle. Both of my rear amps incision line was pretty straight and down lower- pretty much under the belly- does that make sense? I’m not saying there is anything wrong with it- just haven’t seen it before. 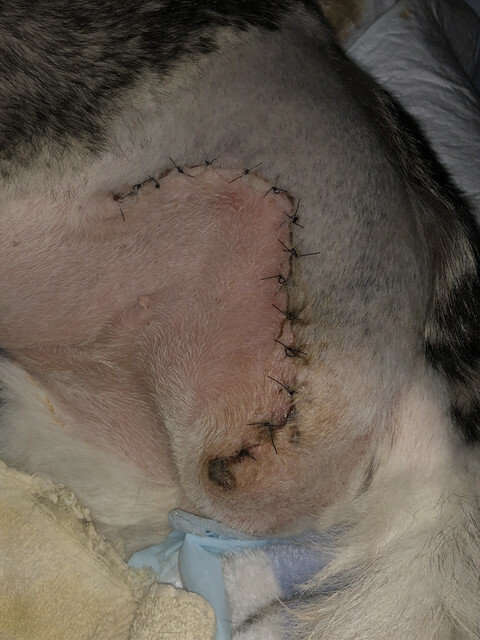 It makes me wonder if you are getting the periodic ‘gushing’ from the seroma because the incision is high and the fluid doesn’t drain until she moves around. 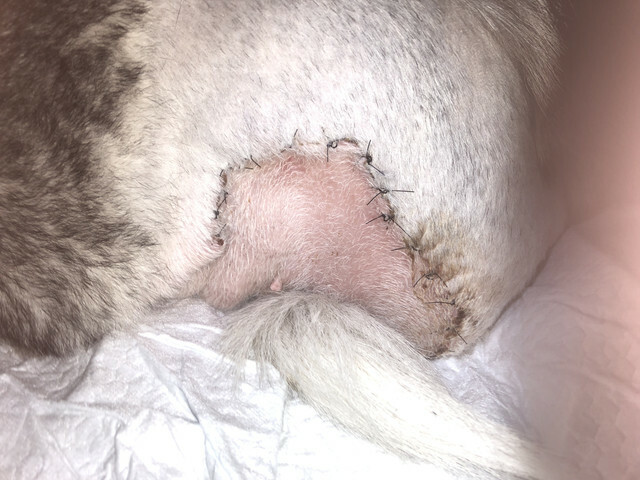 If the incision was lower it might drain more naturally- a little at a time and not build up like you are seeing. 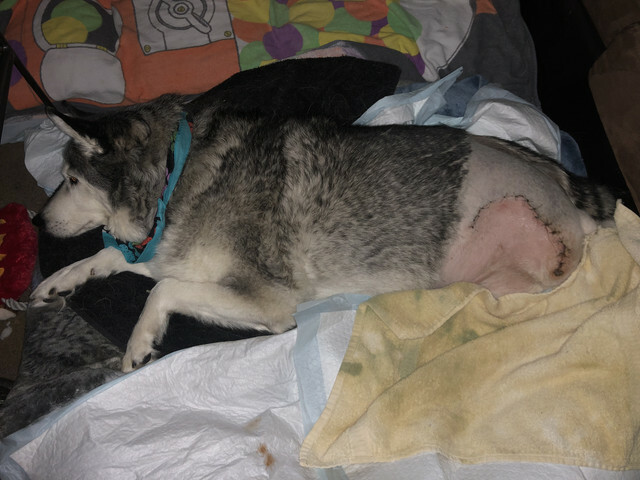 Hopefully the compress and poultice ideas will help reduced the fluid and you get past this point of recovery. Well, day 8 here we are! Still some lava (what I’ve been calling the drainage) coming out. She seemed like she was in a little pain at about 4am so she got a Tramadol and I’ve gotten the OK from the vets office to give them to her if she needs them. I still don’t see any swelling or smell anything other than the coppery smell so that’s good, right? I can’t wait until this damn thing is finished draining! I know I’ve said this before, i am not a vet. To me that incision looks really good. I understand Karen’s line of thinking and it kind of makes sense to me. Yes, no bad smelling odor, no funky color, no pus, yay!! I know this has been a long hard road for you, and as much as you can’t see it, you’re doing a wonderful job!! I’m so sorry it’s been so complicated. Hopefully now things will start to ease up little by little and you’ll see the light at the end of the tunnel. Hang in there, you really are rocking this! It looks like today the drainage is less pink and more clear, and from what I’ve read that’s good! I’ve decided that just letting it soak into towels on her bed is soooo much easier and less stressful than trying to constantly wipe it up and get her all wet with a moist facecloth. It’s getting a little easier on me, yay! I’m hoping once all is said and done and Ziva is healed up and good to go, I can help other people out who are in a panic like I have been. Good plan to not tend to it so much and just let the towels absorb the fluid. Wishing for a much less complicated day that has plenty of naps included in it!! Today has gone pretty smoothly! THANK DOG! This morning, my bf was carrying Ziva out to pee and he must have pressed on her bladder JUST right because she peed ALL OVER the stairwell outside. Oops! Poor girl, but she had to go! We’ve already had a couple of neighbors give her the sad looks and ask what happened. Thankfully, everyone has agreed and said THAT’S YOUR CHILD, so it’s worth every extra day you get with them. As for the seroma , I haven’t seen any drainage at all today, yay!! She did just take her last antibiotic though. Is that ok? She has a vet visit on Monday, so they can prescribe her more if need be. I guess they’ll know better than I do. I also noticed today that the seroma drainage was coming from the part of her body that was the most bruised after surgery. I’m curious if those things are related. Either way, I’m glad it’s not gushing out like lava anymore. I FINALLY got about 6 hours of sleep last night and it was AMAZING. Ziva slept next to me the whole night, so that helped me feel better too. I’m hoping tonight goes smoothly too.